Mike Garvey picked up the 8th last-place finish of his NASCAR Camping World Truck Series career in Friday’s Lucas Deep Clean 200 at the Nashville Superspeedway when his #38 S&W Services Chevrolet fell out with a vibration after 3 of the race’s 150 laps. Garvey has now tied Loni Richardson for fourth in the all-time LASTCAR Camping World Truck Series rankings. Both drivers stand five finishes from tying all-time series leader Wayne Edwards. After he and the #38 team skipped last week’s race at Iowa, Garvey qualified 30th in Nashville’s 34-truck field at a speed of 143.316 mph. The speed ranked him fifth among the nine “go-or-go-homers” in the field. With three laps completed under green, Garvey pulled behind the wall, followed by Mike Harmon, who was driving the second Norm Benning truck that debuted with Iowa last-placer Greg Seevers. *Garvey has swept both last-place finishes at Nashville this season, with both finishes coming in the #38. 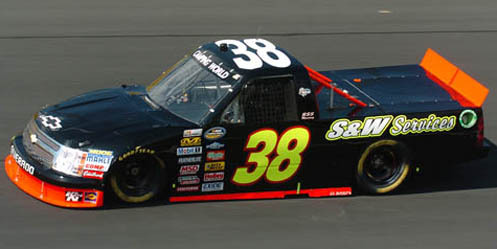 Driver and number have never before finished last in a Truck race at this track, but owner Shane Sieg trailed the field in his #93 back in the 2009 Toyota Tundra 200 at Nashville. Special Thanks to Rob Dostie, a LASTCAR fan who provided his photos of Jeff Green's #55 and the rest of the Bottom Five in today's post! Jeff Green picked up the 5th last-place finish of his NASCAR Sprint Cup Series career in Sunday’s Lenox Industrial Tools 301 at the New Hampshire Motor Speedway when his unsponsored #55 Front Row Motorsports Ford fell out with brake problems after completing 11 of the race’s 301 laps. Bob Jenkins’ Front Row Motorsports (FRM) began 2011 with three teams: the #34 of David Gilliland and the #37 of Robert Richardson, Jr., both locked into the first five races on their 2010 Owner Points rankings, and the #38 of Travis Kvapil, which fell outside the Top 35 following a costly penalty for bleeder valves on his tires at Pocono. The start of the year saw Gilliland turn in a stunning 3rd-place finish in the Daytona 500 while Richardson and Kvapil were both taken out in separate accidents. As both the #38 and #37 fell outside the Top 35 in this year’s Owner Points, single-car owner Larry Gunselman acquired the #37 at Bristol, still using Fords out of the FRM shop with Tony Raines as driver. Since then, both Raines’ #37 and Kvapil’s #38 teams have struggled with each suffering DNQs while Gilliland’s #34 has made every race this year and remained inside the Top 35. 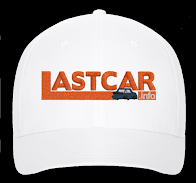 Earlier this month, FRM was set to enter a new third team, an unsponsored #55 Ford, at Kentucky, but withdrew it before the preliminary entry list for the race could be published. Instead, the team looked to make its first attempt at Loudon the following week, putting Jeff Green behind the wheel. Green, a former Nationwide Series champ, was looking to make his first Cup race since driving for Larry Gunselman’s old #64 team at Charlotte last October. Green may have been selected to drive the #55 into the show for scoring his career-best Cup finish, a 2nd, in the 2002 running of the July race. Sure enough, Green qualified for Sunday’s race at a speed of 131.175 mph, putting him 36th on the grid and fourth-ranked among the day’s eleven “go-or-go-homers.” It was a tremendous accomplishment for the team, which had to knock three current teams out of the field after David Stremme and Dennis Setzer joined as last-minute entries. Setzer, driving K-Automotive’s #92, was one of the three who missed the race, joining Scott Riggs in Dusty Whitney’s #81 and Raines in the Gunselman #37. On race day, Green fell to the rear early, followed soon after by current 2011 LASTCAR Cup leader Michael McDowell, fighting an ill-handling #66 Toyota. 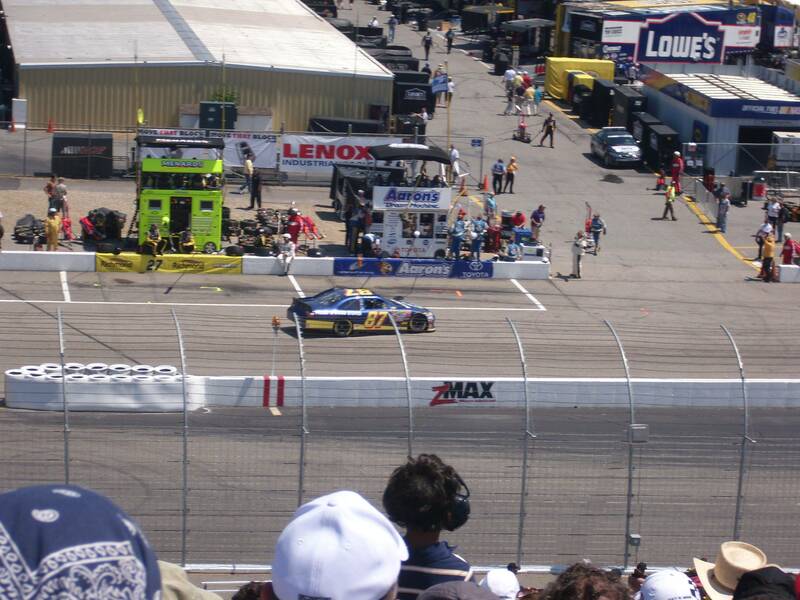 During the opening green-flag stretch, Green was the first to go behind the wall, followed six laps later by three-time last-placer Mike Skinner. Green’s FRM teammates both finished inside the Top 25 with Gilliland’s #34 coming home 25th and J.J. Yeley driving Kvapil’s #38 home 23rd. Yeley had filled-in for Kvapil in anticipation of Kvapil’s running the Truck Series race at Iowa, but some last-minute team changes put Todd Bodine in Kvapil’s ride, leaving him on the sidelines. Truck Series competitor Erik Darnell took over for Yeley in his #46, which has twice finished last in 2011. In two weeks at Indianapolis, Yeley will take over as driver of the #55 FRM team Green raced for on Sunday, parting ways with Whitney Motorsports, whose #46 and #81 will switch from Chevrolet to Ford starting that weekend. *Jeff Green had not finished last in a Cup race since 2007, when his #66 HAAS Automation Chevrolet was involved in a single-car crash after 13 laps of the 2007 Allstate 400 at the Brickyard. *This was the first last-place finish for FRM since 2009, when Tony Raines’ #37 Long John Silver’s Dodge fell out with electrical problems after 6 laps of the 2009 Checker O’Reilly Auto Parts 500 at Phoenix. *The #55 had not finished last in a Cup race since last August, when Michael McDowell’s #55 PRISM Motorsports Toyota fell out with engine failure 16 laps into the 2010 Irwin Tools Night Race at Bristol. *The #55 had not finished last in a Cup race at New Hampshire since 2000, when the engine on Kenny Wallace’s Square D Chevrolet blew 39 laps into the 2000 Dura Lube 300 Sponsored by K-Mart at New Hampshire. That race is better-known for being the day outside-polesitter Jeff Burton led all 300 laps after NASCAR instituted restrictor plates at Loudon following the fatal crashes that took the lives of Adam Petty and Kenny Irwin, Jr. earlier that year. *This was not only Ford’s first last-place finish of 2011, but the manufacturer’s first since 2009, when Bobby Labonte’s #96 DLP Ford fell out with engine trouble after 18 laps of the 2009 CARFAX 400 at Michigan. *This weekend, three teams that made their series debut in Cup (#55), Nationwide (#47), and Trucks (#75) all finished last in the same weekend. As of this moment, I cannot confirm if this is the first time this has ever happened. Scott Wimmer picked up the 3rd last-place finish of his NASCAR Nationwide Series career in Saturday’s New England 200 at the New Hampshire Motor Speedway when his unsponsored #47 Key Motorsports Chevrolet fell out with engine problems after 5 of the race’s 206 laps. 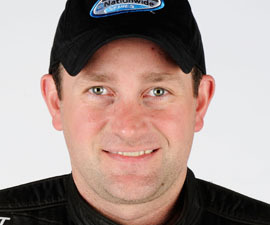 Team owner Curtis Key has fielded cars in the Nationwide Series since 1993, when Rodger Sawyer made his lone series start at his home track of Martinsville with a 14th-place run driving a #05 Moen Faucets Chevrolet. In the eighteen years since, Key Motorsports gradually worked its way from a part-time team to running the full schedule in 2010 with Mike Bliss driving the team’s flagship #40 for most of the races that season. 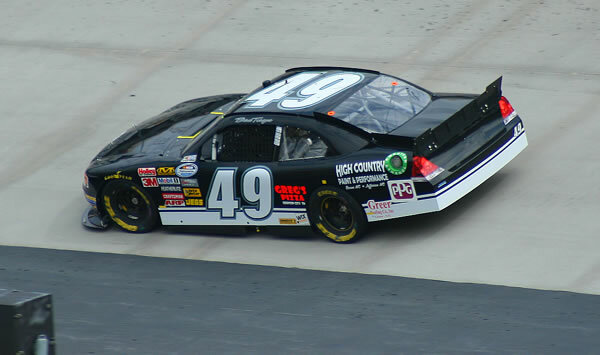 2011 began with Wimmer as Key’s new driver of the #40. 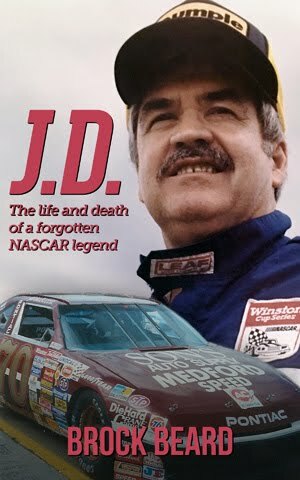 Although Wimmer gave the team a season-best finish of 12th at Talladega, three engine failures and struggles to find sponsorship resulted in a driver change with Charles Lewandoski, known by his crew as “The Polish Rocket,” taking over driving duties of the #40 at Iowa in May. Unfortunately, Iowa also saw Key Motorsports have to bring “start-and-park” teams to the track in order to keep the #40 team going. Tim Andrews debuted Key’s #46 at Iowa with a 39th-place finish, then after the team acquired Chase Miller to help in the effort, Miller took over the #46 and Andrews debuted the #42 at Michigan. Saturday’s race would see a team record four of Key’s unsponsored white Chevrolets in the starting field, which was still one car short of a full 43 entrants. Fastest of Key’s group was 28th-ranked Lewandoski in the #40, followed by 32nd-place Andrews in the #42 and Miller’s #46 in 33rd. Driving the team’s new #47 “start-and-park” team was Wimmer, slowest of the group in 37th at a speed of 120.972 mph. Five laps into the race, still under green at that point, Wimmer pulled behind the wall, followed two laps later by Andrews and another two laps by Miller. 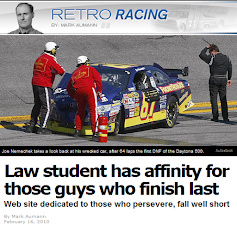 Lewandoski came home 22nd, which is Key Motorsports’ best finish since Wimmer’s Talladega run. *Wimmer had not finished last in a Nationwide Series race since 2002, when his unsponsored #23 Bill Davis Racing Pontiac fell out with engine failure 20 laps into the 2002 Little Trees 300 at Charlotte. *Owner Curtis Key’s Nationwide team had not finished last in a Nationwide race since 1995, when Chuck Bown’s #05 Key Motorsports Ford fell out with engine failure 12 laps into the 1995 Autolite 250 at Richmond. *The #47 had not finished last in a Nationwide Series race since 2009, when Chris Cook’s #47 ConstructionJobs.com Toyota fell out with overheating problems after the opening lap of the 2009 Able Body Labor 200 at Phoenix. 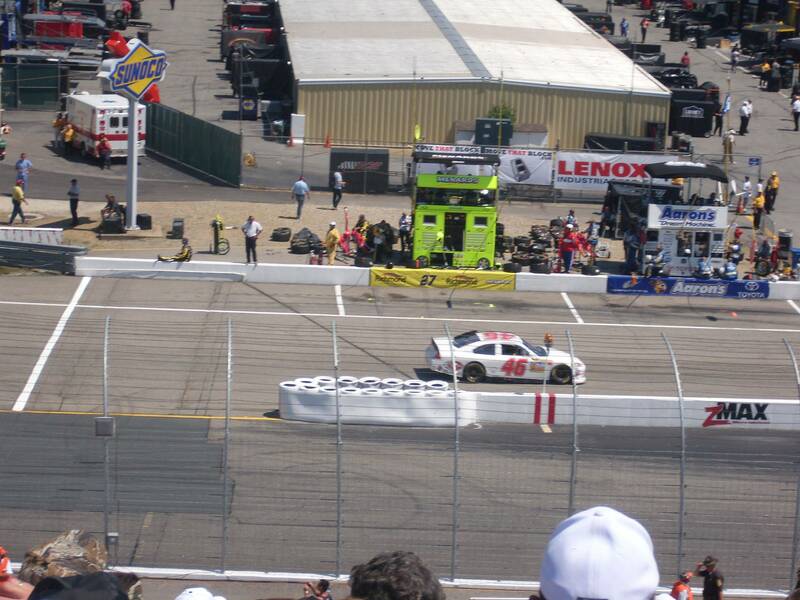 This was the first time the #47 has finished last in a Nationwide Series race at New Hampshire. Mike Skinner picked up the 12th last-place finish of his NASCAR Sprint Cup Series career in Saturday’s inaugural Quaker State 400 at the Kentucky Speedway when his #60 Big Red Toyota fell out with electrical problems after completing 17 of the race’s 267 laps. Kentucky, scene of NASCAR’s first new Sprint Cup venue since 2001, was also the home track of Big Red Soda, who sponsored three teams entered into the race. Skinner, the only Big Red car among the “go-or-go-homers,” was locked-in based on the #60's attempting all 18 races in 2011 after qualifying was cut short by rain. Joining Skinner in the Big Red contingent were Dave Blaney, whose #36 Tommy Baldwin Racing Chevrolet started 32nd, and Mike Bliss, who rolled out 42nd in the FAS Lane Racing Ford #32. In the early laps, Scott Riggs, in Dusty Whitney’s unsponsored red #81, slipped from the 40th starting spot to 43rd, but it was Skinner, still on “start-and-park” duty, who exited the race first during the opening green-flag run. Riggs followed eleven laps later followed by McDowell, who pulled out right after getting the Lucky Dog during the first competition caution on Lap 31. Fellow Big Red Soda drivers Blaney and Bliss finished 33rd and 34th, respectively, each three laps down to race winner Kyle Busch. *The last time the NASCAR Sprint Cup Series added a new track to its schedule was in 2001, when Casey Atwood’s #19 Dodge / UAW-sponsored Dodge was involved in a crash during the opening lap of the inaugural Protection One 400 at Kansas. Dennis Setzer picked up the 14th last-place finish of his NASCAR Nationwide Series career in Friday’s Feed The Children 300 at the Kentucky Speedway when his unsponsored #49 Jay Robinson Racing Chevrolet fell out with brake problems after 2 of the race’s 200 laps. With the finish, Setzer now stands in sole possession of third in the all-time LASTCAR Nationwide Series standings, trailing only Jeff Fuller and current 2011 series leader Jeff Green. Setzer qualified 31st for the race at a speed of 166.605 mph, ranking him eighth among the fifteen “go-or-go-homers” who attempted to qualify for the race. His lap was more than enough to beat Danny Efland and Carl Long, who missed the race. After two laps of the race, Setzer pulled behind the wall under green, followed the next lap by both John Jackson and Chase Miller. Jeff Green came home 37th, retiring after 18 laps. *The race marked Setzer’s second-consecutive last-place finish in a Nationwide race at Kentucky. Last summer, while driving K-Automotive’s #92 Dodge, he fell out after six laps with electrical problems. *Setzer’s other last-place finish in 2011 came last month at Michigan, where his #49 fell out after the opening lap with a vibration. 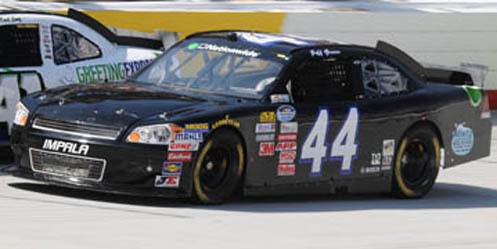 *The #49 had never before finished last in a Nationwide Series race at Kentucky. Johanna Long picked up the 3rd last-place finish of her NASCAR Camping World Truck Series career in Thursday’s UNOH 225 at the Kentucky Speedway when her #20 Panhandle Grading and Paving Toyota was involved in a two-truck accident on Lap 6 of the 152-lap race. Long qualified 21st for the race at a speed of 168.755 mph, ranking her second behind 19th-fastest John King among the session’s “go-or-go-homers.” Coming off the team’s season-best finish of 11th at Texas last month, hopes were high that the Long’s speed would lead to another good finish. Unfortunately, an accident sparked by Timothy Peters on Lap 6 sent Long’s truck spinning backwards into the turn two wall along with Justin Marks, taking both her and Marks out of the race. Long was credited with the last-place finish. King, the fastest “go-or-go-homer,” was also involved in a multi-truck crash late in the race that left him 28th. It was King’s first start of the 2011 season. *It was Long and the #20's first last-place finish since 2010, when she scored the other two finishes of her career. Her most recent came last fall at Texas, where she crashed after the opening lap. 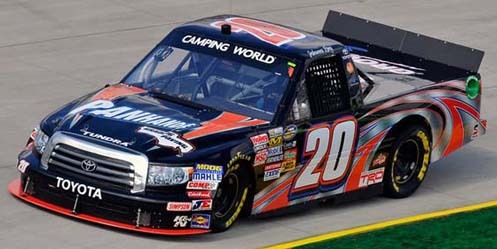 *Neither Long, the #20, nor a Toyota had ever finished last in a Truck Series race at Kentucky. Kevin Conway picked up the 2nd last-place finish of his NASCAR Sprint Cup career in Saturday’s Coke Zero 400 at the Daytona International Speedway when his #97 ExtenZe Toyota fell out with rear gear problems after completing one of the race’s 170 laps. Conway’s weekend began on a high note with a surprising run in Friday’s Nationwide Series race. Three months after team owner Joe Nemechek nearly pulled off the victory in the wild Aaron’s 312 at Talladega, NEMCO Motorsports fielded two blue ExtenZe Toyotas in the race, putting Conway in the #87 and Nemechek in the #97. Locked nose-to-tail in a two-car draft, the duo rocketed into the Top 10 early, then remained there for much of the race. However, with just 10 laps remaining, Conway nudged Nemechek loose in turn four, causing a crash that took both cars out of contention. They held onto the lead lap and came home 25th and 26th. Conway and Nemechek both qualified for the Cup race, apparently set to work together once again. Conway had a fleet #97 in qualifying, putting up the 22nd-fastest time at a speed of 180.310 mph, third-fastest among the “go-or-go-homers.” Nemechek snared the 43rd and final starting spot, but edged Tony Raines and J.J. Yeley - the race’s two DNQs - by more than two tenths of a second. 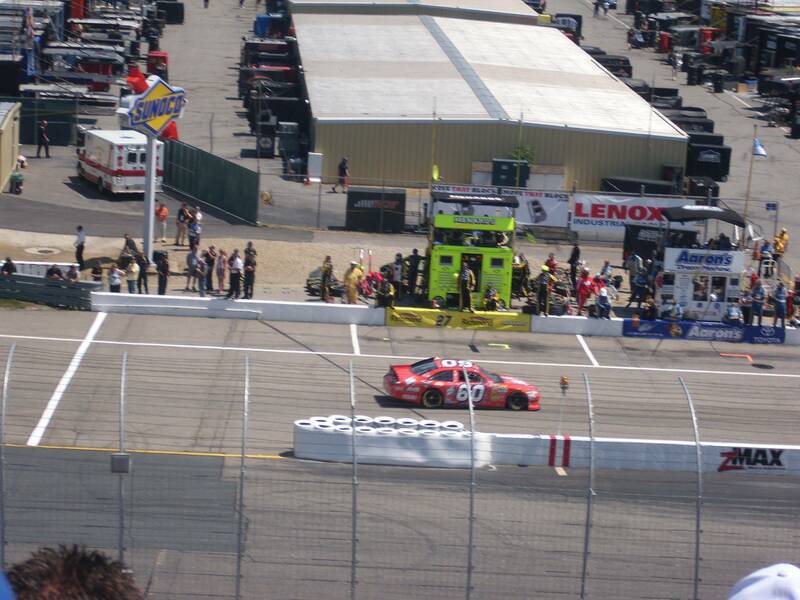 However, when the race began, Conway was quickly behind the wall, back in his “start-and-park” role from Talladega, scene of his first Cup last-place finish. 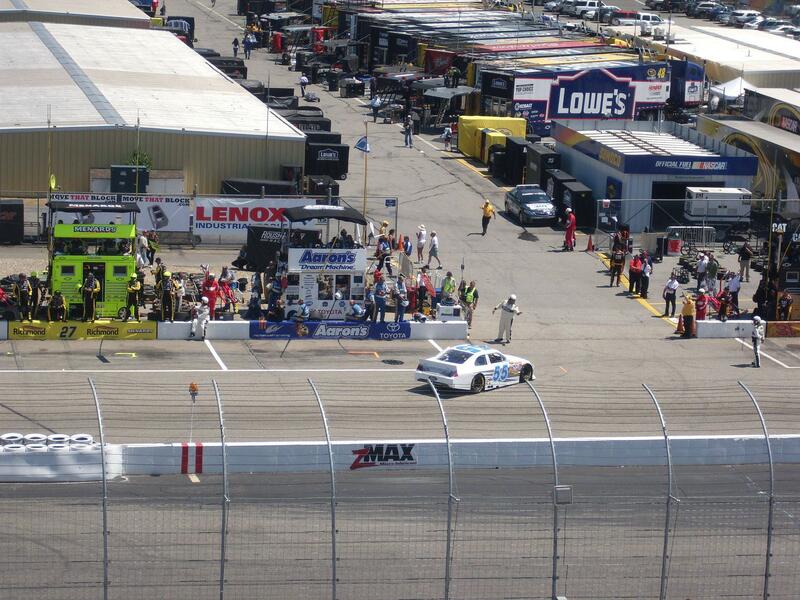 Conway had also left the Talladega race after the opening lap. 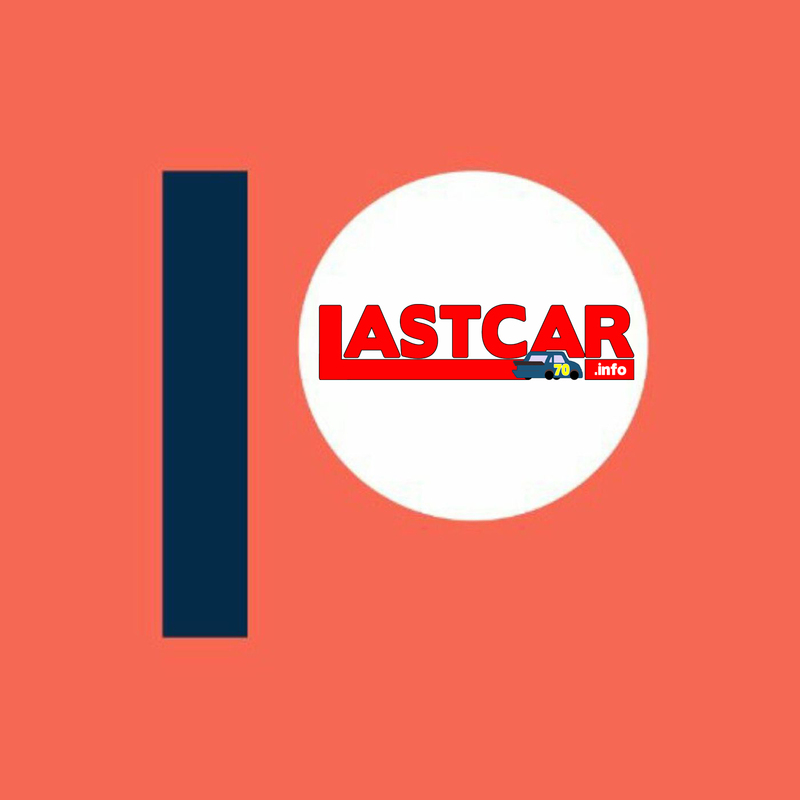 Current LASTCAR Cup Series leader Michael McDowell fell out of the race one lap later, just before Daytona 500 champion Trevor Bayne’s race ended with a very hard crash in turn two. Bayne came home 41st. 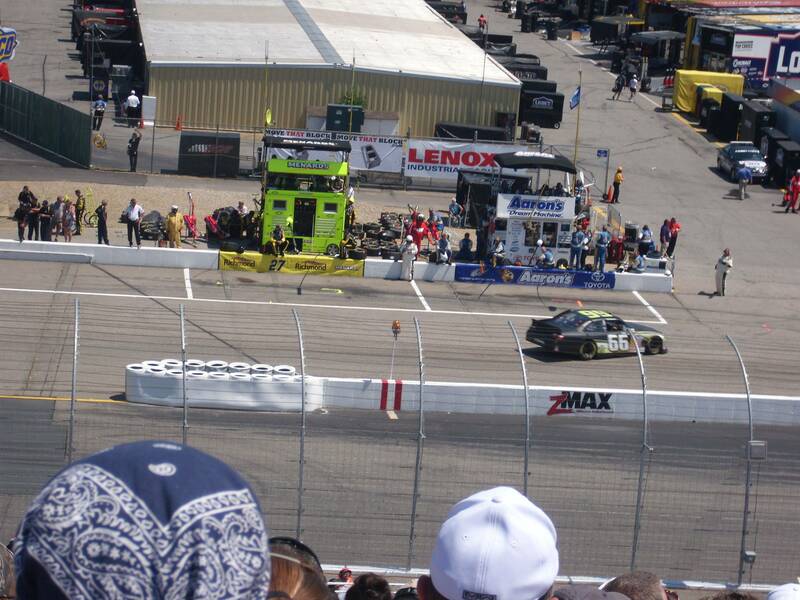 Joe Nemechek, whose #87 carried sufficient sponsorship from ExtenZe and AM FM Energy to run the entire race, was one of many underfunded drivers who contended for the lead during the middle stages of the race. Holding 20th by Lap 37, Nemechek hooked up with Travis Kvapil’s #38, who shoved the #87 into 11th by Lap 66, 7th by Lap 74, and to the lead by Lap 77. Though other pairs of drivers would join the battle for the lead, Nemechek was still in touch with the Top 10 all the way up to the first green-white-checkered finish, when he was swept up in the grinding 15-car crash that took place in turn two. Nemechek came home one lap down in 30th, his best run of the year and the first Cup race he’s finished under power in 2011. David Ragan went on to win his first Cup Series race in an electrifying finish. Curiously, Daytona was the scene of Ragan’s only last-place finish in any of NASCAR’s top three divisions: a crash after four laps of the 2007 Koolerz 300 at Daytona, the season opener for the Nationwide Series. Ragan has yet to finish last in any of his 163 Cup Series starts. *The #97 had not finished last in a Cup race at Daytona since 1997, when Chad Little’s John Deere Pontiac was involved in a multi-car crash after completing 32 laps of the 1997 Pepsi 400 at Daytona. *NEMCO’s #97 has now finished last in three of the last four Cup restrictor-plate points races, including Jeff Fuller’s 43rd-place showing in last fall’s AMP Energy Juice 500 at Talladega. Fuller also finished last in his Gatorade Duel that season. *Conway’s 22nd-place starting spot is the best of this year’s Cup last-place finishers, beating the previous record of 32nd set by both Nemechek at Phoenix and matched by Conway himself at Talladega.